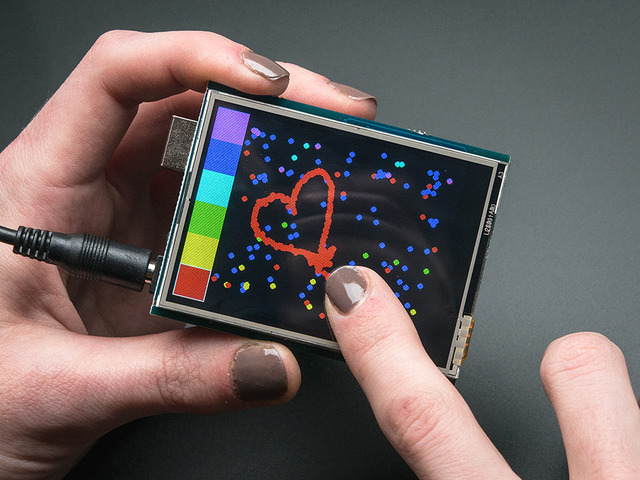 Spice up your Arduino project with a beautiful large touchscreen display shield with built in microSD card connection. This TFT display is big (2.8" diagonal) bright (4 white-LED backlight) and colorful (18-bit 262,000 different shades)! 240x320 pixels with individual pixel control. It has way more resolution than a black and white 128x64 display. As a bonus, this display comes with a resistive or capacitive touchscreen attached to it already, so you can detect finger presses anywhere on the screen. This shield uses a SPI display - its much easier to use with Mega & Leonardo than our v1 shield. We also include an SPI resistive touchscreen controller or a I2C capacitive touch screen controller so you only need one or two additional pins to add a high quality touchscreen controller. Even with all the extras, the price is lower thanks to our parts sourcing & engineering skillz! This display shield has a controller built into it with RAM buffering, so that almost no work is done by the microcontroller. This shield needs fewer pins than our v1 shield, so you can connect more sensors, buttons and LEDs: 5 SPI pins for the display, another pin or two for the touchscreen controller and another pin for uSD card if you want to read images off of it. SDA - This is the I2C data pin used by the FT6206 capacitive touch controller chip. It can be shared with other I2C devices. On UNO's this pin is also known as Analog 4. SCL - This is the I2C clock pin used by the FT6206 capacitive touch controller chip. It can be shared with other I2C devices. On UNO's this pin is also known as Analog 5. Because the TFT is about the same size as an Arduino, we pre-assemble the shield in the factory. To use, simply place it onto your Arduino Uno/Duemilanove/compatible. No wiring, no soldering! Bam! With just a little effort you can make this shield plug-n-play with the Mega/Leonardo. Look at the bottom of the shield and find the area with the 6 jumpers. Three of them are closed, and three are open. Solder close the three ICSP jumpers. You can then cut the small line in between the #11, #12, #13 pads. This will free up digital #11, 12, and 13 for you to use on the Leo or Mega. That's it! No software or firmware hacking other than that is required. With this mod, the shield uses the ICSP header for data so make sure your duino (or stack of shields) has a ICSP plugged into the socket as above! We have a library with example code ready to go for use with these TFTs. The library is not incredibly fast and optimized but its a good start and can easily be ported to other micrcontrollers. However, we'll assume you're using an Arduino. Our github repository contains all the code and examples you'll need for driving the TFT. We have example code ready to go for use with these TFTs. Search for ILI9341 and install the Adafruit ILI9341 library that pops up! 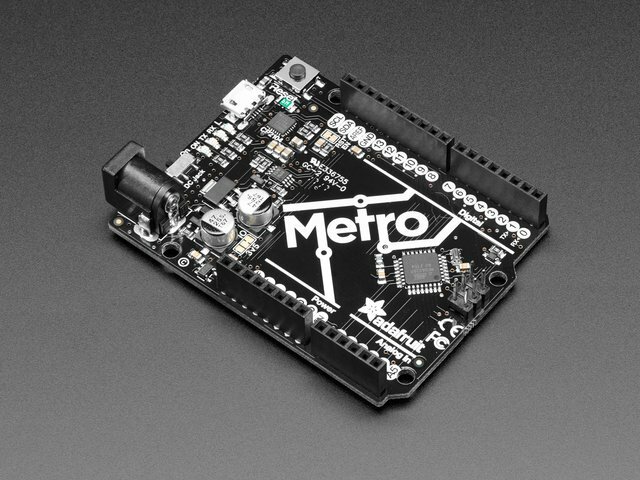 Next up, search for Adafruit GFX and locate the core library. A lot of libraries may pop up because we reference it in the description so just make sure you see Adafruit GFX Library in bold at the top. Repeat this process one more time, looking for the Adafruit_ZeroDMA library. Install that one too. Restart the Arduino software. You should see a new example folder called Adafruit_ILI9341 and inside, an example called graphicstest. 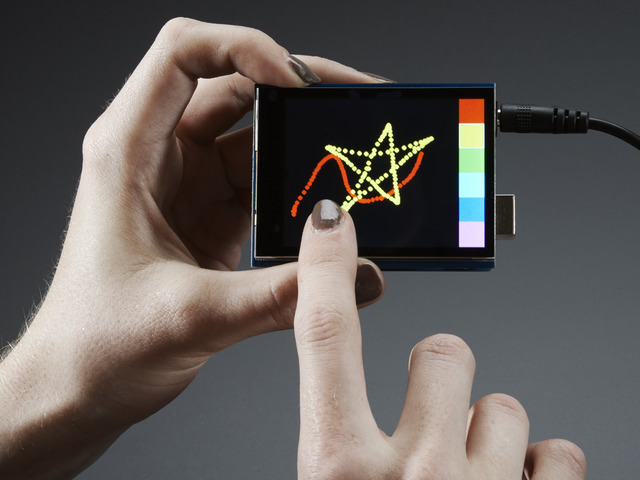 Upload that sketch to your Arduino! You should see a collection of graphical tests draw out on the TFT. This page is for the Resistive Touch Screen version of the Shield! The LCD has a 2.8" 4-wire resistive touch screen glued onto it. You can use this for detecting finger-presses, stylus', etc. Normally, you'll need 4 pins to talk to the touch panel but we decided to go all snazzy and put a dedicated touch screen driver onto the shield. The driver shares the SPI pins with the TFT and SD card, so only one extra pin is needed (digital #8) This allows you to query the controller when you're ready to read touchscreen data, and saves 3 pins. To control the touchscreen you'll need one more library - the STMPE610 controller library which does all the low level chatting with the STMPE610 driver chip. Once you have the library installed, restart the IDE. Now from the examples->Adafruit_ILI9341 menu select touchpaint and upload it to your Arduino. The touch screen is made of a thin glass sheet, and its very fragile - a small crack or break will make the entire touch screen unusable. Don't drop or roughly handle the TFT and be especially careful of the corners and edges. When pressing on the touchscreen, sometimes people can use the tip of their fingers, or a fingernail. If you don't find the touchscreen responds well to your fingers, you can use a rounded stylus which will certainly work. Do not press harder and harder until the screen cracks! We're using hardware SPI so the clock, mosi and miso pins are not defined here. For the shield, CS is #8 always. Check to make sure this returns a True value, which means the driver was found. If it wasn't, make sure you have the hardware SPI jumpers set up right: for Leonardo/Mega the ICSP jumpers get closed. To get the oldest point from the buffer. TS_Point has .x .y and .z data points. The x and y points range from 0 to 4095. The STMPE610 does not store any calibration data in it and it doesn't know about rotation. So if you want to rotate the screen you'll need to manually rotate the x/y points! The z point is 'pressure' and ranges from 0 to 255, we don't use it here but you can experiment with it on your own, the harder you press, the lower the number. This page is for the Capacitive Touch Screen version of the Shield! We now have a super-fancy capacitive touch screen version of this shield. Instead of a resistive controller that needs calibration and pressing down, the capacitive has a hard glass cover and can be used with a gentle fingertip. It is a single-touch capacitive screen only! 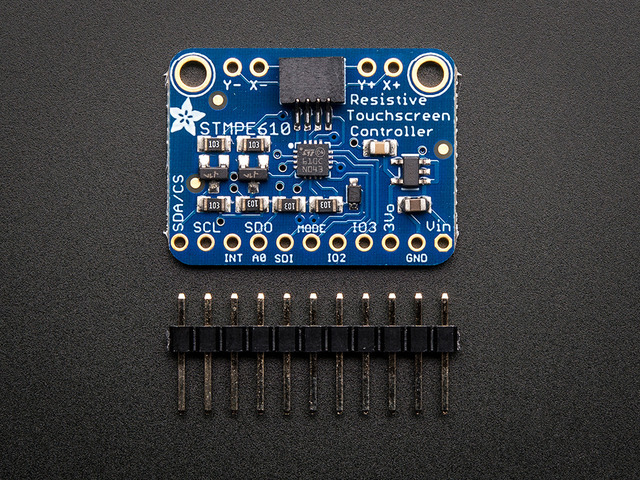 The capacitive touch screen controller communicates over I2C, which uses two hardwire pins. However, you can share these pins with other sensors and displays as long as they don't conflict with I2C address 0x38. Once you have the library installed, restart the IDE. Now from the examples->Adafruit_FT6206 menu select CapTouchPaint and upload it to your Arduino. The touch screen is made of a thin glass sheet, and its very fragile - a small crack or break will make the entire touch screen unusable. Don't drop or roughly handle the TFT and be especially careful of the corners and edges. When pressing on the touchscreen, remember you cannot use a fingernail, it must be a fingerpad. Do not press harder and harder until the screen cracks! We're using hardware I2C which is fixed in hardware so no pins are defined. To get the touch point from the controller. TS_Point has .x and .y data points. The x and y points range from 0 to 240 and 0 to 320 respectively. This corresponds to each pixel on the display. The FT6206 does not need to be 'calibrated' but it also doesn't know about rotation. So if you want to rotate the screen you'll need to manually rotate the x/y points! There is a built in microSD card slot into the shield, and we can use that to load bitmap images! You will need a microSD card formatted FAT16 or FAT32 (they almost always are by default). Copy purple.bmp into the base directory of a microSD card and insert it into the microSD socket in the shield. Now upload the File→Examples→Adafruit_ImageReader→ShieldILI9341 example sketch to your Arduino + shield. You will see the flowers appear! To make new bitmaps, make sure they are less than 240 by 320 pixels and save them in 24-bit BMP format! They must be in 24-bit format, even if they are not 24-bit color as that is the easiest format for the Arduino to decode. You can rotate images using the setRotation() procedure. Several #defines relate to hardware pin numbers, all fixed values when using the shield. 'x' and 'y' are pixel coordinates where top-left corner of the image will be placed. Images can be placed anywhere on screen…even partially off screen, the library will clip the section to load. Image loading is explained in greater depth in the Adafruit_GFX library guide. This guide was first published on Jan 03, 2014. It was last updated on Jan 03, 2014.